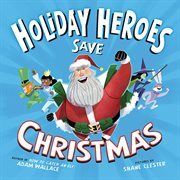 The item Holiday Heroes save Christmas, (electronic resource) represents a specific, individual, material embodiment of a distinct intellectual or artistic creation found in San Francisco Public Library. This just in-breaking news from the North Pole! Santa Claus can't deliver presents on Christmas Eve and he needs backup. But not just anybody can help him-he needs the Holiday Heroes! This Christmas, it's up to the Easter Bunny, the Tooth Fairy, a Witch and a Leprechaun to fill in for Santa and save Christmas. Can the Holiday Heroes deliver presents without being spotted? Will they be able to pull off Christmas in the end?